Ciara Mageean will be out to build on her new Irish Indoor 1500m record at the European Indoor Athletics Championships at the start of March. The Portaferry runner, 26, is one of 16 athletes named in the Ireland team. World Under-20 high jump silver medallist Sommer Lecky, 18, will make her senior championship debut. Lauren Roy and Conall Kirk are also included for the Glasgow event despite disappointing performances at the national championships. 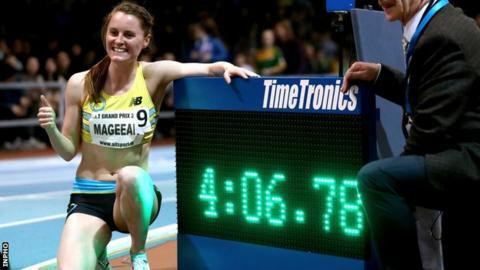 Mageean is ranked fifth on the European indoor list in the women's 1500m and ran an impressive four minutes and 6.78 seconds last Wednesday to better the record time she set in 2016. Along with Ireland's athlete of 2018 Thomas Barr, Mageean is among the more experienced campaigners in a youthful Irish team. Castlederg's Lecky, a Commonwealth Youth Games gold medallist two years ago, jumped 1.90 metres to claim silver in Finland. She is one of a number of Under-20 medallists to make the step up to senior competition for Ireland along with sprinters Roy, Molly Scott and Ciara Neville. There is also a place for 800m runner Kirk to make his senior debut. The Annadale Striders runner is coached by his father and former British 800m runner Mark Kirk, and will be out to improve on a disappointing sixth place finish in Athlone on Sunday.